Here’s an event to commemorate the centennial of American involvement in the Great War that might be of interest to those of you in the Knoxville area. On Thursday, Feb. 23 UT’s Department of History and the Center for the Study of War and Society will co-host the Second Annual Fleming-Morrow Distinguished Lecture in African-American History. Chad L. Williams, Associate Professor and Chair of the African and Afro-American Studies Department at Brandeis University, will discuss “Torchbearers of Democracy: The History and Legacy of African American Soldiers in World War I.” Like his book of the same name, Williams’s talk will examine the 380,000 black soldiers whose WWI service was part of a larger battle waged both at home and abroad. The lecture is at 5:30 p.m. in the Alumni Memorial Building, Room 210. It’s free to the public, with a book signing to follow. I was sorry to see my semester as a graduate assistant at the McClung Museum come to an end. It was a fantastic gig at a great institution with wonderful people, and reminded me how much I enjoy museum work. I’m hoping I end up back there before my career as a Ph.D. student runs out. Still, being a teaching assistant again has its perks. What I love most about it isn’t so much being a teacher as being a learner. Because TAs attend the professor’s lectures in addition to conducting the weekly discussion sections, we’re basically getting paid to learn from top-notch scholars. It’s a pretty sweet deal, especially when you consider that most students have to pay or take out loans to take these courses. And since graduate students usually get a new TA assignment every semester, we get to see the survey courses taught from a variety of different perspectives and using multiple approaches. By the time we finish our degrees, we might sit through both halves of American history, world history, or Western Civ twice from beginning to end, hearing a new professor’s take on the material each time. I doubt any other group of people in the world gets the benefit of such a wide-ranging education in history as we’re able to get just by showing up for work. Graduate school can be grueling. There’s no doubt about that. But those of us who are able to work as apprentices to great professors should remember how lucky we are. I’ve run across some strange stuff while poking around in Tennessee’s early history, but nothing as bizarre as a newspaper report J.L. Bell has uncovered. Bell quotes the story as it appeared in the Hampshire Gazette on Sept. 24, 1794, and notes that it also popped up in various other newspapers with attributions to the Knoxville Gazette, the first paper published in what’s now Tennessee. Unfortunately, searchable copies of the Knoxville Gazette aren’t yet available online. 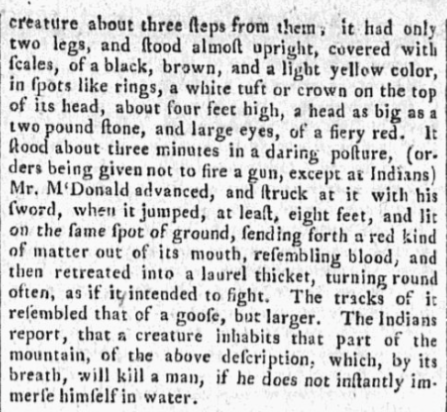 But here’s the same item from the Aug, 30, 1794 issue of the Baltimore Daily Intelligencer. It’s identical to the one Bell found in the Hampshire Gazette. 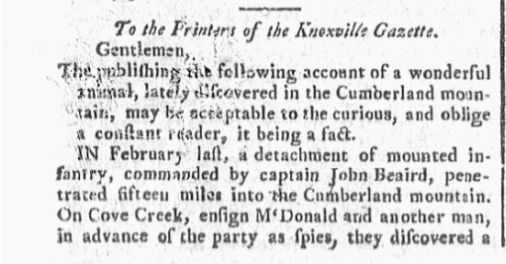 Since the opening is addressed to “the Printers of the Knoxville Gazette,” I assume this is the same text that appeared in that paper. One wonders who submitted it to the Knoxville Gazette in the first place, but there doesn’t seem to be a name attached to any of the versions available online. The reference to Indian lore is interesting. Reptilian creatures do appear in Cherokee mythology. The most well-known is probably the Uktena, a great horned serpent bearing a crystal in its forehead. But I’m not aware of any creature from southeastern Native lore matching the description of the thing these militiamen encountered. As Bell notes, William Blount referred to it as “Cheeklaceella” when he mentioned the article in a 1798 letter to John Rhea. I couldn’t find that word in an electronic search of texts on Indian mythology. In fact, I couldn’t find it anywhere except in a printed version of Blount’s letter from Samuel Gordon Heiskell’s book on early Tennessee history. What I find notable is the fact that newspapers across the country picked up this bizarre report from the Tennessee frontier. Readers in Massachusetts, New Hampshire, New York, and Maryland would have read the story of the militiamen who encountered a mysterious creature in the Cumberland mountains, and editors in these cities seem to have been aware of what their colleagues on the frontier were printing. Lately I’ve been going through letters written by settlers in southwestern Virginia during the Revolutionary era, and I’m surprised at how often they refer to events in Boston, Philadelphia, Yorktown, and even Europe. Similarly, eastern newspapers picked up news from Kentucky and the Tennessee country and disseminated it all along the seaboard. We tend to think of the eighteenth-century trans-Appalachian West as a remote, isolated region, but frontier folk were very much a part of early American communication networks. Louis Figuier’s 1863 book The World Before the Deluge was a time machine between two covers. By the mid-nineteenth century, geologists knew that different rock layers and the fossils entombed in them corresponded to distinct periods of time, ages when animals and plants unlike any known to modern man had populated the globe. Figuier took his readers on a grand tour of these geologic periods—or rather, he did so with the assistance of Édouard Riou, whose evocative engravings brought these extinct environments back to life. If you’ve ever read a paleontology textbook, visited a natural history museum, watched a documentary on evolution, or stepped into a science classroom, you’ve probably seen a modern variation of these sequential deep time scenes. Paintings in books, dioramas in museums, and CGI clips on TV often take the form of the “prehistoric highlights reel” that Figuier and Riou helped popularize. And although the science of paleontology has changed a great deal since the 1860s, the organisms that populate our own scenes from deep time tend to correspond with those Riou associated with specific periods. The dates assigned to the scenes have changed (and in the case of he dinosaurs, the physiology of the animals has changed, too), but the cast has remained much the same. The scenes start out with marine invertebrates, then move on to primitive chordates and fish, then amphibians and early terrestrial organisms, then dinosaurs and other Mesozoic reptiles, then mammalian megafauna, and finally humans. I had a lot of books on prehistoric life when I was a kid, and the sequence of illustrations was pretty consistent across most of them: marine invertebrates, jawless fish, jawed fish, amphibians, dinosaurs, mammals, and Homo sapiens. This sequence may seem inevitable; after all, it’s the order in which the major groups of organisms appeared. But there’s a sense in which it’s misleading. The illustrations tend to be much better at highlighting when groups of organisms appeared or were especially prominent than they are at indicating how long they flourished. Take reptiles, for example. Many illustrators will throw one in around the late Carboniferous to mark the emergence of the first reptiles, or perhaps include a picture of the sail-backed Dimetrodon in the Permian. Pictures of reptiles then dominate the Mesozoic, and then tend to disappear from pictorial sequences and time charts altogether after the age of dinosaurs. The artificiality of deep time imagery is even more apparent when you look at fish. Illustrators highlight fish when they’re the only vertebrates around, but once amphibians show up and start colonizing the land, fish more or less vanish from the pictures. Likewise, you don’t see many amphibians in illustrations of scenes dating from after the first appearance of reptiles. And invertebrates tend to disappear entirely once animals with backbones evolve, even though they make up more than 95% of all extant species described so far. These charts and sequential images also tend to favor terrestrial over aquatic life. Marine organisms are plentiful in scenes of early eras, when there’s no life on land. But once terrestrial animals appear, many geologic time scales omit marine life altogether, except for the occasional aquatic reptile from the Mesozoic (presumably included because they look really cool). You can see the same sequence of organisms in illustrated charts and tables of geologic time. Take a look at this one produced by CliffsNotes. Invertebrates for the earliest periods populate the oldest periods at the bottom, and then it’s fish, terrestrial animals, dinosaurs, and mammals. Not a single invertebrate after the first appearance of insects. Here’s another one from a professional development site for teachers. It’s pretty consistent with the one above. Invertebrates, fish, plants, amphibians, dinosaurs, large mammals, and finally man up at the top. The point I’m belaboring here is that pictorial sequences of earth history and illustrated geologic time charts are as notable for their omissions as they are for what they include. There’s a sort of implicit narrative thrust at work here, focused on organisms that are vertebrate, terrestrial, and warm-blooded. Organisms, in other words, that seem most relevant to our own origins. Now, I’ve never needed an excuse to discuss extinct organisms here before, but this post isn’t one of my gratuitous prehistoric indulgences. I raise the issue of scenes from deep time because it offers insights into the ways we think about the more recent, human past. We might compare the treatment of some historical subjects in textbooks and survey courses to depictions of organisms in pictorial sequences of deep time. Just as illustrators render some animal groups invisible once a more recent group arrives on the scene, so we tend to render Indians invisible after, say, King Philip’s War, Jacksonian removal, or Wounded Knee. But Native Americans didn’t vanish after these important turning points. They might have ended up in a different location, but they didn’t become extinct or irrelevant, any more than amphibians became extinct once animals started laying amniotic eggs. And the descendants of Spanish colonists in the American Southwest didn’t cease to exist after the mid-1800s, when Anglophone Americans took political control of the region. They were there the whole time, just as birds kept fluttering along through the mass extinction of 65 million years ago and the emergence of large mammals afterward. In the same way, just as it’s misleading to ignore marine life and focus exclusively on terrestrial life after the movement of the first organisms into land, it’s also misleading for history books and courses to ignore the Southwest after the passage of the “frontier” era, or to be attentive to southern history only during the Civil War, New South, and civil rights eras. And our discussions of such important changes as the Industrial Revolution shouldn’t blind us to the fact that most Americans remained tied to agriculture long after the first steam engines started puttering, just as most organisms remained invertebrates long after the first backbones appeared. Our selective memory of history suffers from the same problems as our selective memory of the story of the life on this planet. We need to remind ourselves to step away from selective scenes of the past to take in the sweep of the whole drama. And we need to stop thinking of history in terms of a “highlights reel” of status scenes, and start thinking of it as a totality.